Some may find being home bound for several days as a slow moving hurricane passes very frustrating. I am fortunate enough to currently have power and materials close at hand. This presents an opportunity to sit down to some extended workbench sessions. This time of year part of my attention turns the coming holiday season. 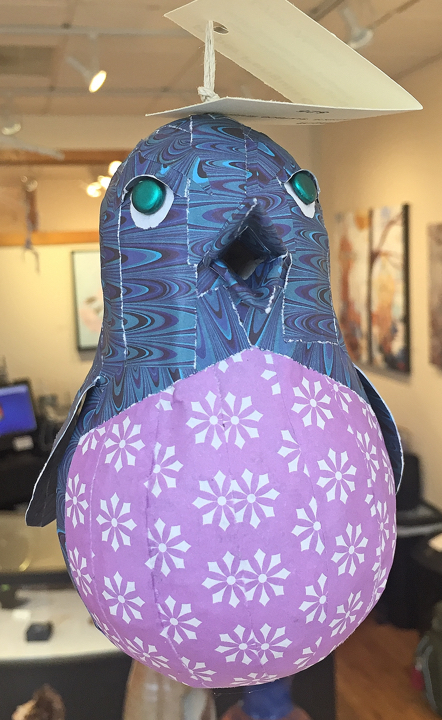 In addition to my art doll sculptures, I create handcrafted original ornaments and some extra jewelry for the gallery. Usually, these ornaments reflect what is currently occurring in my sculpture. One influence on the items populating my sketchbook is a recent trip to Iceland. A charming addition to the amazing and other worldly landscape one encounters is sheep everywhere. 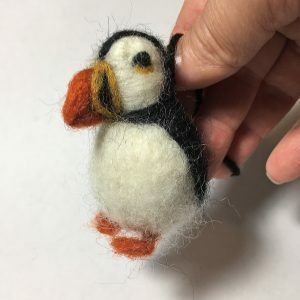 In response to this, I have planned both art dolls and this season’s ornaments utilizing the technique of needle felting. I am still very much in the design phase, but thought I’d share a couple of works-in-progress images. I snapped both of these quick shots in my studio with my phone. There is one more arctic inspired creature, a reindeer, that I’m designing. I will refine each a bit for production efficiency, and have a selection in the Hillsborough Gallery of Arts starting in mid November. I was also finishing up a small completely sculpted little figure piece this week. In stead of wigging and costuming as I do with my art dolls, I sculpted minimal clothing and hair from paperclay. I decided to do a bit of experimentation with the surface treatment of this piece. 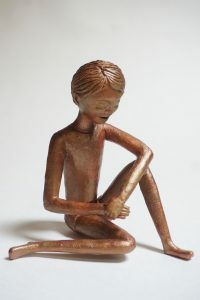 I created a “faux bronze’ finish with the layering of metallic bronze paint and a moss patina glaze. With any luck Hurricane Florence will allow me to get a bit more accomplished today as well. This entry was posted in Uncategorized and tagged Hillsborough Gallery, holiday ornament, holiday ornaments, needle felting, ornament, polar bear, puffin, the Hillsborough Gallery of Arts on September 14, 2018 by lynnadmin. As I shared last time, now is of course the season that the gallery gets decked out for the holidays. 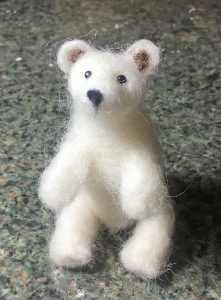 I had put in some overtime in the creation of new art dolls earlier in the fall, and then turned my attention to some other gift type items for installation at the Hillsborough Gallery of Arts in mid November. 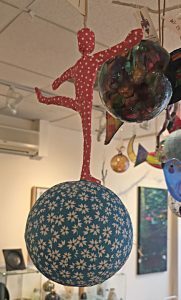 I was still doing some design work on one additional type of ornament when we hung the holiday show a couple of weeks back, so I didn’t get the chance to share them with you last time. I had been toying with the idea of a steampunk style vintage hot air ballon that would combine several of the media I like to play with in the studio. 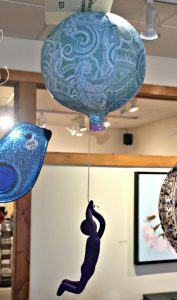 There are currently three of these hot air balloons flying among the ornament selection in the gallery, and I’ll be getting started on a new batch over the weekend. I’m quite pleased with the end result, though they did take a bit of working and reworking until they had exactly the look I was going for. In fact, the one pictured was the very first I completed, and I tweaked the design with each of the subsequent. I think I finally have something close to a formula, but as with all of my work, each one is a unique one of a kind sculpture all its own. Each balloon starts with a paper maché ball that I smooth out with a coating of paperclay. After sanding, I hand paint and antique each. The baskets come to life with some light metal fabrication, and decking out with some goodies from my embellishment stash. 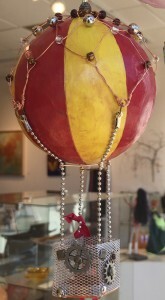 Lastly, I create a beaded wire net and connect the ballon to the basket with some chain. 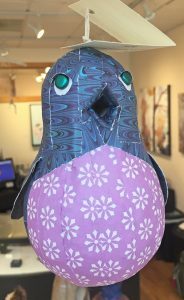 They are perhaps a bit labor intensive for just a holiday ornament, but there is no reason they can’t be hung to fly in the home year round. This entry was posted in Uncategorized and tagged hanging sculpture, Hillsborough Gallery, holiday ornament, hot air balloon, mixed media, one of a kind, sculpture, steampunk, the Hillsborough Gallery of Arts on December 4, 2015 by lynnadmin.